While there are a variety of ways to get sound in and out of your PC, sometimes a simple way is the best. One of the products that caught my eye recently is the CAD U2 USB Stereo Headphone with Microphone and the manufacturer was kind enough to send one over for review. 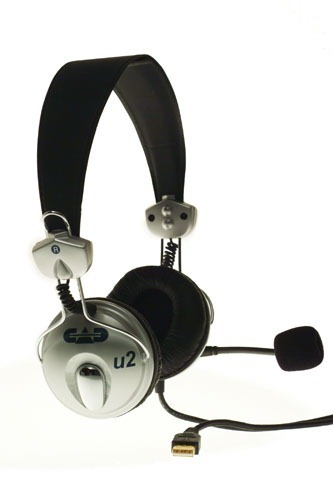 The U2 combines stereo over-ear headphones with a gooseneck mic that sits to the side of your mouth, offering consistent sound pickup and minimizing popping and breath sounds. When not in use, the mic rotates up against the headband, completely out of the way. I tested the U2 on an HP notebook that I recently upgraded to Windows 7 64-bit. The system recognized the USB device and installed drivers as soon as I plugged in the headset. At first I experienced popping and crackling during audio playback, but as it turned out the issue had nothing to do with the U2 and installing an updated Windows 7-compatible chipset driver from HP resolved it. While I’m by no means an audiophile, I do own a pair of high-end headphones and appreciate good sound. I was pleasantly surprised by the U2. Music sounded great through the headset, and I’d have no hesitation using the mic to record a podcast or voiceovers for a presentation. I also tested the headset with Skype, calling other Skype users and regular landlines, and it worked flawlessly. Podcasters should note that the U2 produces no sidetone and when recording audio (or using the headset for VoIP) you do not hear yourself through the earphones. While you can tweak Windows to feed the mic audio back to the headset, the fact that audio has to pass through the USB device twice causes a small but noticeable delay. However, real-time monitoring simply can’t be done through USB or Firewire adapters – even PC recording solutions costing many times more than the U2 require that you plug your headphones into the analog stream. I personally didn’t find that this caused any difficulty during recording. Overall, whether for podcasting, gaming, VoIP or just listening to music, the CAD U2 is simply hard to beat and easily blows away competing products costing two to three times its US $40 street price. That’s probably a question best asked of Sony or CAD. I just got my CAD U2 in the mail yesterday. First thoughts are that the headphones are a little heavy on the bass but otherwise sound great and the microphone works very well. In my hour or so of using I could not be happier. I purchased the CAD u2 headset for podcasting, however, there is a constant background humm, with Skype and Garage Band, that renders the headset useless. If anyone knows how to get rid of the “humm” I would appreciate a reply. I’ve not experienced any hum with it, and since you’re using Garage Band I assume you’re on an Apple and they have reasonable power filtering. I’d suspect a defective headset.